We have in stock a string winding tool which is essential for stringing up a guitarra. It is called an alicate para torcer cordas. It is used to make loops in the ends of the steel strings. Since guitarras are made in small quantities their scale lengths are all different. Therefore, it is necessary to custom make strings so the loops on each end are just the correct distance apart. Years ago the strings for the guitarra were sold on little spools and the guitarristas had to make loops on both ends of the strings. Nowadays the strings for Portuguese guitarras are sold in sets with a loop on one end of the string, nevertheless, the player must stilll put a loop in the one end of the string. At the moment we have these Portuguese made "alicates" (string winders) with blue handle for sale at $75.00 plus shipping (see bottom of page). 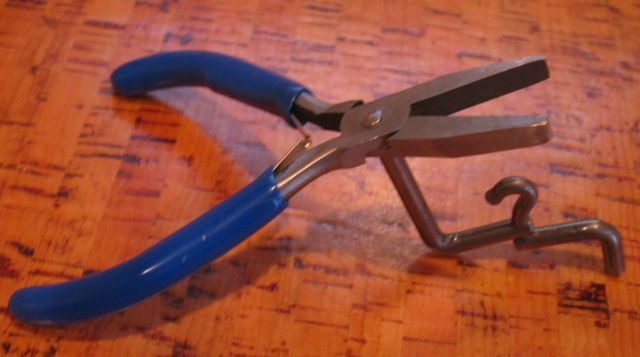 If we don't have the Portuguese-made plier-type of strings winders in stock, then we have a nice little brass alternative device (pictured below) for $75 plus shipping. Please contact us by e-mail so we can tell you which we have. Strings for the Portuguese guitarra are $15.00 per set plus a flat $4.00 per order for 1 to 5 sets of strings in the United States. There are 12 strings on the guitarra. We have sets for the Lisbon style guitarra and for the Coimbra style guitarra.